Turtles and tortoises belong to the order of reptiles known as Chelonia. While the term “turtle” is used in a general way to refer to any member of this group, “tortoise” is usually reserved for a chelonian that lives strictly on land. A third term, “terrapin,” is sometime used to describe freshwater turtles as opposed to sea turtles. All turtles and tortoises have scales and a hard shell, and all lay eggs that they bury in soil, sand or vegetation. Like other reptiles, they are ectothermic, which means they regulate body temperature through external means, such as warming themselves by sunning. Neither turtles nor tortoises have teeth—instead, they use the hard edges of their mouths to bite. Turtles spend most of their lives in or near water. Sea turtles rarely leave the ocean except to come ashore to lay eggs, while freshwater turtles will climb out of ponds and lakes onto logs or rocks to warm themselves in the sun. Tortoises are land-dwellers and often live in hot, dry habitats. They burrow in the ground to cool themselves, rather than venture into the water, as they cannot swim. Turtles have webbed feet, which helps them swim efficiently, and are generally more streamlined than tortoises. Tortoises have round and stumpy feet with claws for gaining traction and walking on land. They are typically larger and heavier. 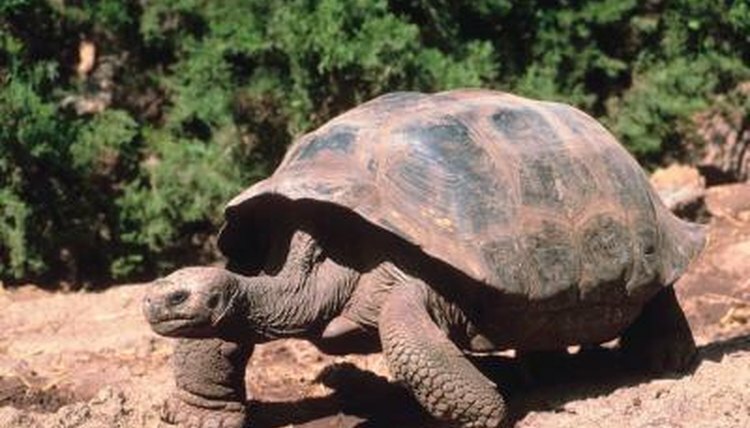 The giant Galapagos tortoise can grow to 900 pounds. The exception to this rule is the leatherback sea turtle, which can grow to 2,000 pounds. The shell of a tortoise is round and domed, whereas turtle shells are flatter. Most turtles are omnivorous, dining on plants, fish, worms and insects. Most tortoises are herbivores, eating grasses, flowers and shrubs, although some species will also eat insects and worms.